The NOVAWO Women's Two-Way Infinity or Straight Scarf is a fashionable and versatile addition to any woman's accessory wardrobe. Uniquely made, this scarf is actually two scarves in one. 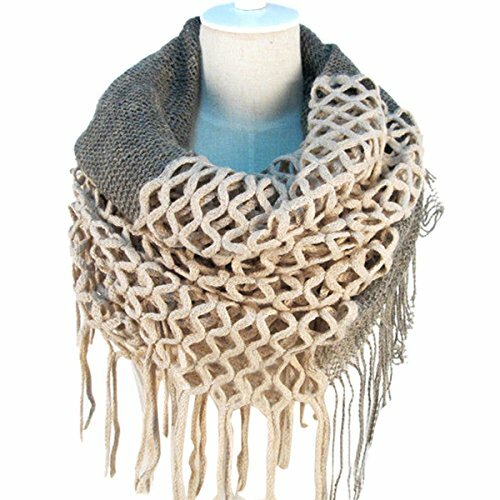 The scarf is made of two sections of high quality fabric sewn together to create a tube form, and may be worn either as a traditional long scarf or as an infinity scarf. The scarf is reversible, with mesh overlay on one side as shown, and the second side patterned. To wear as an infinity scarf, simply slip your head through the hole created by the tube form of the scarf, and adjust as needed to get the look you love.